Stewart, Rory. Places in Between - Paperback. Ehrenreich, Barbara. Nickel and Dimed : On (Not) Getting by in America. Murphy, Dean. Gay Men Pursuing Parenthood through Surrogacy: Reconfiguring Kinship. Friedman, Thomas L. Hot, Flat, and Crowded Why We Need a Green Revolution--and How It Can Renew America. Ehrenreich, Barbara. Nickel and Dimed: On (Not) Getting by in America - Paperback. Zakaria, Fareed. The Post-American World: Release 2.0 - Hardcover. From Nickel and Dimed to Against All Enemies, from	War Is a Force That Gives Us Meaning to From Nyet To Da, we can help you find the current affairs books you are looking for. As the world's largest independent marketplace for new, used and rare books, you always get the best in service and value when you buy from Biblio.com, and all of your purchases are backed by our return guarantee. The End of Faith: Religion, Terror, and the Future of Reason (2004) is a book written by Sam Harris, concerning organized religion, the clash between religious faith and rational thought, and the problems of tolerance towards religious fundamentalism. Harris began writing the book in what he described as a period of "collective grief and stupefaction" following the September 11, 2001 attacks. The book comprises a wide-ranging criticism of all styles of religious belief. The New York Times Middle East correspondent profiles this troubled region, describing the everyday horrors of Beirut, the intricacies of Arab politics, Arab-Israeli relations, and American perceptions of the region. 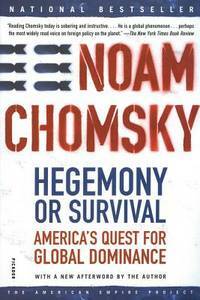 Hegemony or Survival: America's Quest for Global Dominance, published November 2003, is a book by Noam Chomsky, a macroscopic view of United States foreign policy from World War II to the post-Iraq War reconstruction. Thomas L. Friedman is one of America's leading interpreters of world affairs. Born in Minneapolis in 1953, he was educated at Brandeis University and St. Anthony's College, Oxford. His first book, From Beirut to Jerusalem , won the National Book Award in 1988. Mr. Friedman has also won two Pulitzer Prizes for his reporting for The New York Times as bureau chief in Beirut and in Jerusalem. He lives in Bethesda, Maryland. On September 16, 2007, machine gun fire erupted in Baghdad's Nisour Square leaving seventeen Iraqi civilians dead, among them women and children. The shooting spree, labeled "Baghdad's Bloody Sunday," was neither the work of Iraqi insurgents nor U.S. soldiers. The shooters were private forces working for the secretive mercenary company, Blackwater Worldwide. This is the explosive story of a company that rose a decade ago from Moyock, North Carolina, to become one of the most powerful players in the "War on Terror." In his gripping bestseller, awardwinning journalist Jeremy Scahill takes us from the bloodied streets of Iraq to hurricane-ravaged New Orleans to the chambers of power in Washington, to expose Blackwater as the frightening new face of the U.S. war machine. Ann Coulter is the author of five New York Times bestsellers, including How to Talk to a Liberal (If You Must) , Treason, Slander, and High Crimes and Misdemeanors . From the Trade Paperback edition. From the author of the #1 bestseller Three Cups of Tea, the continuing story of this determined humanitarian's efforts to promote peace through educationIn this dramatic first-person narrative, Greg Mortenson picks up where Three Cups of Tea left off in 2003, recounting his relentless, ongoing efforts to establish schools for girls in Afghanistan; his extensive work in Azad Kashmir and Pakistan after a massive earthquake hit the region in 2005; and the unique ways he has built relationships with Islamic clerics, militia commanders, and tribal leaders even as he was dodging shootouts with feuding Afghan warlords and surviving an eight-day armed abduction by the Taliban. He shares for the first time his broader vision to promote peace through education and literacy, as well as touching on military matters, Islam, and women-all woven together with the many rich personal stories of the people who have been involved in this remarkable two-decade humanitarian effort.Since the 2006 publication of Three Cups of Tea, Mortenson has traveled across the U.S. and the world to share his vision with hundreds of thousands of people. He has met with heads of state, top military officials, and leading politicians who all seek his advice and insight. The continued phenomenal success of Three Cups of Tea proves that there is an eager and committed audience for Mortenson's work and message. David K. Shipler worked for the New York Times from 1966 to 1988, reporting from New York, Saigon, Moscow, and Jerusalem before serving as chief diplomatic correspondent in Washington, D.C. He has also written for The New Yorker, the Washington Post, and the Los Angeles Times. He is the author of three other books— Russia: Broken Idols, Solemn Dreams; Arab and Jew: Wounded Spirits in a Promised Land (which won the Pulitzer Prize); and A Country of Strangers: Blacks and Whites in America. Mr. Shipler, who has been a guest scholar at the Brookings Institution and a senior associate at the Carnegie Endowment for International Peace, has taught at Princeton University, at American University in Washington, D.C., and at Dartmouth College. He lives in Chevy Chase, Maryland. War Is a Force That Gives Us Meaning is a 2002 nonfiction book by socialist journalist Chris Hedges. In the book, Hedges draws on classical literature and his experiences as a war correspondent to argue that war seduces entire societies, creating fictions that the public believes and relies on to continue to support conflicts. He also describes how those who experience war may find it exhilarating and addicting. A #1 New York Times bestseller: A visionary analysis of the degradation of our public sphere and its consequences for our democracy Nobel Peace Prize winner, bestselling author, activist, and political icon, Al Gore has become one of the most respected and influential public intellectuals in America today. The Assault on Reason takes an unprecedented look at how faith in the power of reason?the idea that citizens can govern themselves through rational debate?is now under assault. The marketplace of ideas, once open to everyone through the printed word, has been corrupted by the politics of fear, secrecy, cronyism, and blind faith. By leading us to an understanding of what we can do to restore the rule of reason, Gore has written a farsighted and powerful manifesto for clear thinking. Bill O'Reilly is a twenty-year veteran of the television industry and has won two Emmy Awards for excellence in reporting. He served as a national correspondent for ABC News and as an anchor for the nationally syndicated Inside Edition and holds two master's degrees, one in public administration from Harvard and another in broadcast journalism from Boston University. He lives on Long Island with his wife and their daughter. "Hell is empty, and all the devils are here." -Shakespeare, The Tempest As soon as the financial crisis erupted, the finger-pointing began. Should the blame fall on Wall Street, Main Street, or Pennsylvania Avenue? On greedy traders, misguided regulators, sleazy subprime companies, cowardly legislators, or clueless home buyers? According to Bethany McLean and Joe Nocera, two of America's most acclaimed business journalists, the real answer is all of the above-and more. Many devils helped bring hell to the economy. And the full story, in all of its complexity and detail, is like the legend of the blind men and the elephant. Almost everyone has missed the big picture. Almost no one has put all the pieces together. All the Devils Are Here goes back several decades to weave the hidden history of the financial crisis in a way no previous book has done. It explores the motivations of everyone from famous CEOs, cabinet secretaries, and politicians to anonymous lenders, borrowers, analysts, and Wall Street traders. It delves into the powerful American mythology of homeownership. And it proves that the crisis ultimately wasn't about finance at all; it was about human nature. Among the devils you'll meet in vivid detail: • Angelo Mozilo, the CEO of Countrywide, who dreamed of spreading homeownership to the masses, only to succumb to the peer pressure-and the outsized profits-of the sleaziest subprime lending. • Roland Arnall, a respected philanthropist and diplomat, who made his fortune building Ameriquest, a subprime lending empire that relied on blatantly deceptive lending practices. • Hank Greenberg, who built AIG into a Rube Goldberg contraption with an undeserved triple-A rating, and who ran it so tightly that he was the only one who knew where all the bodies were buried. • Stan O'Neal of Merrill Lynch, aloof and suspicious, who suffered from "Goldman envy" and drove a proud old firm into the ground by promoting cronies and pushing out his smartest lieutenants. • Lloyd Blankfein, who helped turn Goldman Sachs from a culture that famously put clients first to one that made clients secondary to its own bottom line. • Franklin Raines of Fannie Mae, who (like his predecessors) bullied regulators into submission and let his firm drift away from its original, noble mission. • Brian Clarkson of Moody's, who aggressively pushed to increase his rating agency's market share and stock price, at the cost of its integrity. • Alan Greenspan, the legendary maestro of the Federal Reserve, who ignored the evidence of a growing housing bubble and turned a blind eye to the lending practices that ultimately brought down Wall Street-and inflicted enormous pain on the country. Just as McLean's The Smartest Guys in the Room was hailed as the best Enron book on a crowded shelf, so will All the Devils Are Here be remembered for finally making sense of the meltdown and its consequences. Robert D. Kaplan is chief geopolitical analyst for Stratfor, a private global intelligence firm, and the author of fourteen books on foreign affairs and travel translated into many languages, including The Revenge of Geography: What the Map Tells Us About Coming Conflicts and the Battle Against Fate; Monsoon: The Indian Ocean and the Future of American Power; Balkan Ghosts: A Journey Through History; and Warrior Politics: Why Leadership Demands a Pagan Ethos . He has been a foreign correspondent for The Atlantic for more than a quarter-century. In 2011 and 2012, Foreign Policy magazine named Kaplan among the world’s “Top 100 Global Thinkers.” From 2009 to 2011, he served under Secretary of Defense Robert Gates as a member of the Defense Policy Board. Since 2008, he has been a senior fellow at the Center for a New American Security in Washington. From 2006 to 2008, he was the Class of 1960 Distinguished Visiting Professor in National Security at the U.S. Naval Academy, Annapolis. Yossef Bodansky, author of the New York Times #1 bestseller bin Laden: The Man Who Declared War on America, is the director of the Congressional Task Force on Terrorism and Unconventional Warfare. In addition, he is the director of research at the International Strategic Studies Association and a senior editor for the Defense and Foreign Affairs group of publications. The author of eight books on international terrorism and global crises, he is a former senior consultant for the U.S. Departments of Defense and State. He lives in the Washington, D.C., area.